*zinc oxide, titanium oxide, red petrolatum- when zinc and titanium are not non-nano, they completely block the sun but they penetrate the skin and end up in internal organs, while the red petrolatum is coming from mineral oil. My recipe, as you can see, has nothing to do with this kind of chemistry and how could it have? I do not have access to such ingredients! The type of zinc I use is NON NANO. When you decide to make your own sunscreen, you’ ll search for non nano zinc oxide. This means it is not absorbed by the skin and is the strongest material that acts against UV-B and UV-A rays, responsible for the burning of the skin’s inner layers, which we are not able to notice. Which company, really, does guarantee to you that its sunscreen protects against UV-A? So in our cream, we can use zinc oxide, non nano, from 5% to 20% of the final product, depending on what texture we want to achieve. Beware, the more zinc oxide you put, the more the product thickens, so remember that for every extra amount of zinc oxide, non nano, you add, you must also add up extra vegetable oil. Well, nobody of us has such equipment to measure the levels of SPF, but I do know that I can reach at least SPF 20, a nice level I think; perhaps even more because of the vegetable oils. On the other hand, the “high” SPF on conventional sunscreens is not true. For example, in natural sunscreen when we have an SPF 2, protects from harmful sun rays by 50%, with an SPF 15, we are protected by 93%, while SPF 34 protects by 97%. how do I measure these percentages? Special guests: the watermelon seed oil, which may not show any specific SPF, but contains over 60% fatty acids, acts against aging, stimulates elasticity and actively contributes to the reconstruction of even the most damaged skin tissues. It opens the pores, it’s absorbed directly, it’s thin and suitable for all tskin types. 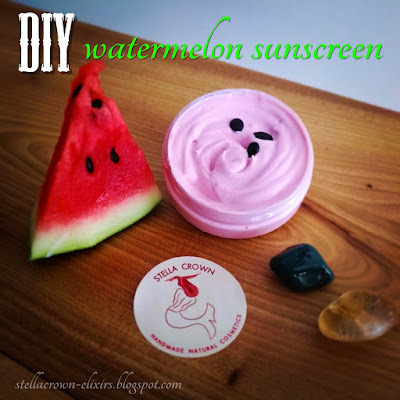 If I had to remake the after sun cream, watermelon seed oil would be one of the main ingredients. Next guest, the green tea extract! Rich in polyphenols, catechins, tannins and caffeine, it fights free radicals and prevents the appearance of cancer cells. Green tea polyphenols have the ability to protect against skin cancer by correcting the damage caused to DNA by ultraviolet radiation! Before we start making our sunscreen, we sterilise tools, containers, work surface and we wear gloves. The colour of the cream is coming from a handmade alkanna tinctoria extract in coconut oil, 1:4 ratio. I put the root and the oil in a double boiler for about an hour, on a mild fire. I drained the oil with a thin muslin and added 1 gram of vitamin E in order to avoid the oil oxidation. In recipe I only used 5 grams. And that's why color is pink and not red. Whoever wants, adds more. Alcanna root has healing and refreshing properties, while the classic and favourite coconut oil gives us 4-10 SPF. We dissolve the zinc oxide with a little bit of floral water, until it takes the form of a paste. Mix and leave aside. We follow the cosmetic cream preparation procedure, which you can find here. Raspberry oil has the highest SPF 30-50. It effectively protects against UV-A and UV-B rays, while deeply hydrates and moistures the skin. Sesame seed oil has SPF 4-10. It is also ideal for hydrating and rejuvenating the skin, while it is widely used in anti-aging products due to its high vitamin E content. Pomegranate seed oil is known for its brilliant antioxidant effect. It restores the damaged skin while has SPF 15. Coconut oil, classic and favourite ingredient, with infinite properties, anti-aging, refreshing, soothing, it nourishes and moisturizes in depth while provides SPF 4-10. Shea butter penetrates up to the 5th layer of the skin and gives us a SPF 6-10. 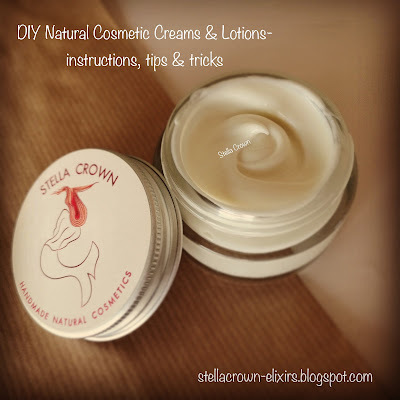 In this recipe, I added beeswax because I needed a product which maintains the skin moisture at normal levels, while on the other hand it gives the cream a waterproof character. Romantic lavender is an excellent skin toner and treats effectively all skin imperfections, while sage flower water is cool, invigorating and ideal for sun-drenched skin. Aloe vera gel is soothing, moisturizing and provides the production of new skin cells. Provitamin B5 (d- panthenol) heals and soothes rritations and wounds drastically, while vitamin E provides a rich softening effect, maintaining normal skin moisture.